One autumn day, an itinerant Buddhist monk stopped at Ariwara-dera Temple in Yamato on his way to Hase Temple. According to legend, Ariwara-dera Temple was built by Ariwara no Narihira. 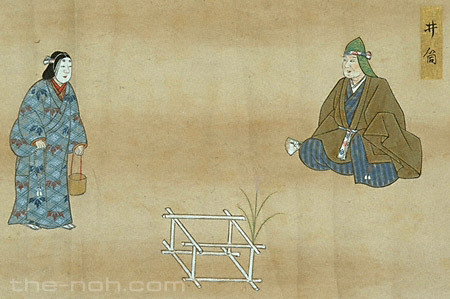 While the monk was praying for the repose of the souls of Ariwara no Narihira and his wife, a village woman appeared with flowers and water as an offering to the deceased. In response to the monk’s inquiries, the woman told about a love story between Ariwara no Narihira and a daughter of Ki no Aritsune. Young Narihira and the daughter, who compared their heights at the well head, grew to adulthood and got married after exchanging love poems. The woman revealed to the monk that she was the daughter of Ki no Aritsune, then she disappeared behind the old burial mound. Thinking it strange, the monk heard from a local passerby the story of Narihira and his wife, Lady Izutsu. The passerby recommended that the monk hold a memorial service for the spirit of Lady Izutsu. Deep in the night, the ghost of Lady Izutsu appeared in his dream while the monk was taking a nap. The woman in his dream wore Narihira’s headdress and nōshi (an imperial court male’s kimono) and danced showing her love and yearning for him. Her appearance was reflected in the water in the well as she sought some trace of Narihira. The dawn came, and the ghost of Lady Izutsu disappeared. The monk was awakened from the dream. Izutsu is one of the masterpieces of mugennoh, which even Zeami himself praised as his best work. 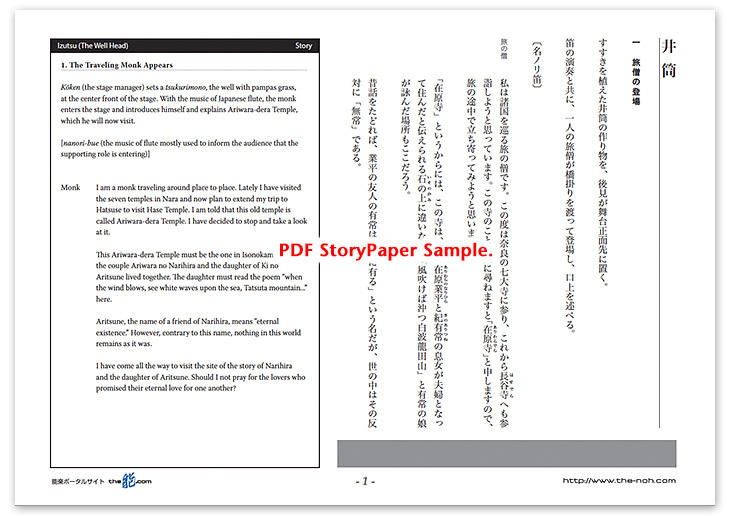 The story of Izutsu centers on the story of “Tsutsu-izutsu,” the twenty-third story in Ise Monogatari (Tale of Ise). Zeami interpreted the man and woman in this story as Ariwara no Narihira and the daughter of Ki no Aritsune, respectively. This is a visionary noh story in which a woman who has been waiting for her husband, Lady Izutsu (the daughter of Aritsune), reflects herself in the well in his attire and looks back upon her days with him. The tsukurimono (large stage props) of the well, with a few stalks of Japanese pampas grass, emphasize the lonely atmosphere in the autumn.